An para-umbilical hernia develops next to the umbilicus and will often push the tummy button to one side or distort its shape. 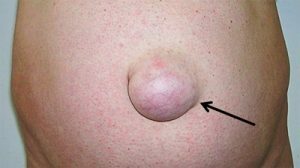 Some para-umbilical hernias are very small and painful whereas others may become very large indeed, yet cause no symptoms. Para-umbilical hernias are most common in older men who are overweight. They may develop after a period of lifting, straining or coughing. This can weaken the abdominal muscles, cause pain and allow a hernia to bulge through. Hernias are more common in people with heavy manual jobs and become more frequent as you get older. These hernias may be repaired with you asleep (under general anaesthetic), or with you awake (under local anaesthetic). The method of repair and anaesthetic will be discussed by your specialist at the time of your out-patient consultation. Once anaesthetised, using a small cut near the umbilicus, the hole in the muscle wall is identified. The hernia may be closed using stitches or even a mesh, depending on the size of the hernia. Dissolving stitches are usually used for the skin.